The Commerce Department reported that factory orders declined in October for the first time in three months, led by a drop in commercial aircraft orders. Excluding volatile requests for transportation equipment, demand rose for the month and was up 6% year-to-year. A proxy for business investments, which has been lagging for months, rose 4.6% from October 2016, a sign that such orders are making a comeback. The U.S. trade deficit widened 8.6% to $48.7 billion in October, the biggest trade gap in nine months, according to the Bureau of Economic Analysis. Exports were unchanged from September, while imports rose 1.6% to a new record. Oil led imports, followed by consumer goods from China, Mexico and the European Union, suggesting greater U.S. consumer spending. Exports were held back by seasonal slumps in aircraft and some farm products. The non-manufacturing sector continued to expand in November for the 95th consecutive month. The ISM non-manufacturing index slowed after exceptionally strong readings in the previous two months, including a 13-year high in October. Although most components of the index slowed their pace, the overall reading stayed above the 12-month average. The Bureau of Labor Statistics reported that productivity grew at a 3% annual rate from July through September. That was the biggest increase in three years, although it probably was boosted by hurricane recovery efforts. Sluggish productivity has been an ongoing concern since the U.S. recovery from the Great Recession. Productivity is key to maintaining the standard of living and raising wages, which fuels economic growth. Year-to-year, productivity increased 1.5% – vs. a 2.1% average since 1947, a level that hasn’t been reached since 2010. The moving four-week average of initial unemployment claims fell for the first time in four weeks, when the labor market measure hit its lowest point in more than 44 years. Jobless applications were 32% below the 50-year average, according to the Labor Department, and continued to point to a persistent reluctance among employers to let workers go. Demand for workers should build pressure for higher wages and increased consumer spending, which drives about 70% of U.S. economic activity. 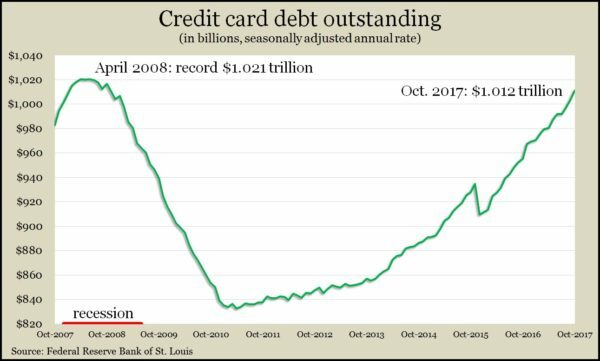 The Federal Reserve reported that growth in credit card debt quickened in October, suggesting that Americans were more comfortable about spending. So-called revolving credit expanded by $8.3 billion from September, an annual rate of 9.9%, the biggest jump since November 2016. 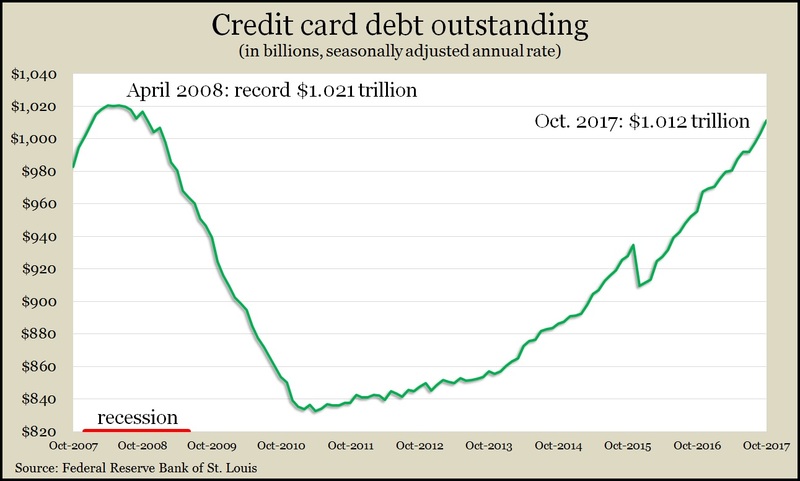 The bulk of consumer credit – non-revolving credit, including student loans and automotive financing – rose by $1.2 billion or an annual rate of 5.3%. U.S. employers added 228,000 jobs in November, 31% above the monthly average for 2017 and more than analysts forecast. It marked the 86th consecutive month of gains. Manufacturing, construction, health care and professional services led the areas that were hiring. Average wages rose 2.5% from November 2016, less than analysts expected but up from 2.3% in October. The unemployment rate remained at 4.1%, the lowest in 17 years. Most of the data reported from the Bureau of Labor Statistics signaled continued strong hiring markets. The level of wholesale inventories sank 0.5% in October, as sales rose 0.7%. As a result, the Commerce Department reported, the ratio of inventories to sales also declined, reaching a level last seen in early 2015, about where it was as the recession was winding down. Companies have been trying to bring that ratio down to better align supply and demand. The ratio climbed to a post-recession peak in January 2016. While signaling continued optimism, the University of Michigan’s survey of consumer sentiment fell slightly in a preliminary December reading. Respondents suggested they’re lowering expectations a little for coming months, especially Democrats concerned about effects from federal tax proposals. Overall feelings toward current economic conditions rose from November. Sentiment reached an expansion high in October and suggests consumer spending will rise 2.7% in 2018.